The private label portfolio has been developed to proactively capitalize the opportunities raised from the EU health claims regulation. The products are based on proprietary mixtures containing essentials nutrients and other (patented) ingredients to reduce disease risks, maintain good health or support beauty. Within this context the products are designed in a way to guarantee effective health communication and market access for all global market places. Because all products can be supplied including EU-compliant label texts, artwork, internet packaging, certification, notification and export documentation, we can kick-start your brand with state of the art health products. Bone is hard tissue and includes, among other collagen and calcium. Bones protect and support the system of muscles and soft tissue that lies beneath. Bone tablets can be made with a branded or patented ingredient and include all relevant micronutrients that contribute to the maintenance of healthy bones and support the digestive system to absorb calcium from food. The formula has approximately 290 mg available for adding any ingredient(s) of choice, in order to make the product optimal effective, customize it to market trends or comply with regulatory criteria. Use 2 tablets daily and take care of your bones with these high quality nutrients. Cartilage is a special form of connective tissue with an elastic character and acts as a shock absorber between joints enabling people to move smoothly. 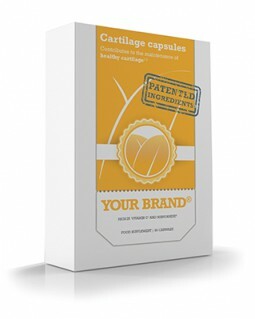 Cartilage capsules can be made with a branded or patented ingredient and include all relevant micronutrients that contribute to maintain healthy cartilage and support normal formation of connective tissue. The formula has approximately 500 mg available for adding any ingredient(s) of choice, in order to make the product optimal effective, customize it to market trends or comply with regulatory criteria. 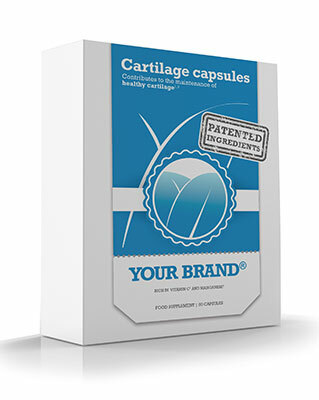 Use 1-2 capsules daily and take care of your cartilage with these high quality nutrients. Muscles are tissue structures of cells which have the property to be able to contract, facilitating motion of the skeleton enabling us to be mobile. Muscle tablets can be made with a branded or patented ingredient and include all relevant micronutrients that contribute to the maintenance of healthy muscle function and support a normal neurotransmission. The formula has approximately 750 mg available for adding any ingredient(s) of choice, in order to make the product optimal effective, customize it to market trends or comply with regulatory criteria. Use 2 tablets daily and take care of your muscles with these high quality nutrients. The immune system (defence system) is the name for all processes that protect the body against adverse external influences or from within. Immune capsules can be made with a branded or patented ingredient and include all relevant micronutrients that contribute to maintaining a healthy immune system and support the production of immune cells. The formula has approximately 850 mg available for adding any ingredient(s) of choice, in order to make the product optimal effective, customize it to market trends or comply with regulatory criteria. Use 1-2 capsules daily and take care of your immune system with these high quality nutrients. Energy is the power or heat from food that is converted by combustion. It is important for muscles, for talking, for thinking and all sorts of other things that a man does. Energy tablets can be made with a branded or patented ingredient and include all relevant micronutrients that contribute to the activation of natural energy and support the reduction of fatigue. The inhalation of air and the process, by which oxygen is transported from the lungs via the blood to the tissues, is of vital importance for the human being. Oxygen capsules can be made with a branded or patented ingredient and include all relevant micronutrients that contributes to maintaining a healthy oxygen transport in the body, supports the amount of iron in the blood and helps the iron transport in the body. The formula has approximately 900 mg available for adding any ingredient(s) of choice, in order to make the product optimal effective, customize it to market trends or comply with regulatory criteria. Use 1-2 capsules daily and take care of the oxygen transport with these high quality nutrients. The heart and cardiovascular system is a closed system of vessels through which blood flows, enabling nourishment of tissues with oxygen and nutrients and taking care of waste being discharged properly. Cardio capsules can made with a branded or patented ingredient and include all relevant micronutrients that contribute to maintaining a healthy heart function, a healthy functioning of blood vessels and support the maintenance of a normal blood pressure. The formula has approximately 500 mg available for adding any ingredient(s) of choice, in order to make the product optimal effective, customize it to market trends or comply with regulatory criteria. Use 1-2 capsules and take care of your heart, blood vessels and blood pressure with these high quality nutrients. Blood is an important constituent of the human body that serves as a transport vehicle for oxygen, nutrients and waste products. Blood capsules can be made with a branded or patented ingredient and include all relevant micronutrients that contribute to the maintenance of healthy blood formation, maintenance of normal red blood cells, help normal red blood cell formation and support the maintenance of healthy blood clotting. Digestion means digesting food to substances that can be absorbed by the body. The digestive system ensures that the food is transported and is broken down into particles that can be assimilated by the body. Digestion capsules can be made with a branded or patented ingredient and include all relevant micronutrients that contribute to the maintenance of a healthy digestive system and support the production of hydrochloric acid in the stomach. The formula has approximately 150 mg available for adding any ingredient(s) of choice, in order to make the product optimal effective, customize it to market trends or comply with regulatory criteria. Use 1-2 capsules and take care of your digestion with these high quality nutrients. Moisture or water is important in the uptake of nutrients in the gut, the transport of nutrients and waste products through the body and to control the body temperature. Electrolyte tablets can be made with a branded or patented ingredient and include all relevant micronutrients that contribute to maintaining a healthy electrolyte balance and support a normal water and mineral balance. The formula has approximately 375 mg available for adding any ingredient(s) of choice, in order to make the product optimal effective, customize it to market trends or comply with regulatory criteria. Use 2 tablets daily and take care of your electrolyte balance with these high quality nutrients. Lining (mucosa) is a thin layer of cells that produces mucus to protect organs and to transport waste materials. Mucosa capsules can be made with a branded or patented ingredient and include all relevant micronutrients that contribute to the maintenance of healthy mucous membranes and support maintaining a normal membrane structure. The formula has approximately 1050 mg available for adding any ingredient(s) of choice, in order to make the product optimal effective, customize it to market trends or comply with regulatory criteria. Use 1-2 capsules daily and take care of your mucous membranes with these high quality nutrients. Weight loss starts with a realistic goal weight and should be based on a suitable exercise regimen, a healthy diet and the use of complementary food supplements. Weight loss capsules can be made with a branded or patented ingredient and include all relevant micronutrients that contribute to the feeling of satiety, lipid metabolism and the metabolism of carbohydrates, fat and protein. The formula has approximately 150 mg available for adding any ingredient(s) of choice, in order to make the product optimal effective, customize it to market trends or comply with regulatory criteria. Use 6 capsules daily and take care of weight loss with these high quality nutrients. Basically, detoxification means cleaning the blood. This is done by removing impurities from the blood in the liver, where toxins are processed for elimination. Detox capsules can be made with a branded or patented ingredient and include all relevant micronutrients that support the cleansing effect by the liver, contribute to the protection of cells from oxidative stress and help to maintain a healthy skin. The formula has approximately 550 mg available for adding any ingredient(s) of choice, in order to make the product optimal effective, customize it to market trends or comply with regulatory criteria. Use 1-2 capsules daily and support your inner health with these high quality nutrients. The metabolic system is responsible for burning calories, the release of energy from food and processing waste. Metabolism capsules can be made with a branded or patented ingredient and include all relevant micronutrients that contribute to the maintenance of healthy metabolism, play a role in the amino acid synthesis and support the functioning of the thyroid. The formula has approximately 600 mg available for adding any ingredient(s) of choice, in order to make the product optimal effective, customize it to market trends or comply with regulatory criteria. Use 1-2 capsules daily and take care of your metabolism with these high quality nutrients. The fat metabolism is the physiological process by which the body breaks down fat from the nutrients absorbed in the intestines. Fat metabolism capsules can be made with a branded or patented ingredient and include all relevant micronutrients that support maintaining a healthy lipid metabolismand contribute to normal conversion of carbohydrates, fat and proteins into energy. The formula has approximately 650 mg available for adding any ingredient(s) of choice, in order to make the product optimal effective, customize it to market trends or comply with regulatory criteria. Use 1-2 capsules daily and support your fat metabolism with these high quality nutrients. The blood sugar level is the amount of glucose present in the blood and that is transported throughout the body to provide cells and tissues with energy. Bloodsugar tablets can be made with a branded or patented ingredient and include all relevant micronutrients that contribute to the maintenance of a healthy blood glucose level, help normal metabolism of carbohydrates and support the metabolism of glycogen and macro nutrients. The formula has approximately 1150 mg available for adding any ingredient(s) of choice, in order to make the product optimal effective, customize it to market trends or comply with regulatory criteria. Use 2 tablets daily and take care of your blood sugar level with these high quality nutrients. Cognition can refer to knowledge, the mind or the contents thereof, such as ideas or beliefs. It has to do with the extent to which we are able to use knowledge and information to record and process. Cognition capsules can be made with a branded or patented ingredient and include all relevant micronutrients that contribute to the maintenance of healthy cognition, memory, concentration and support learning ability. The formula has approximately 550 mg available for adding any ingredient(s) of choice, in order to make the product optimal effective, customize it to market trends or comply with regulatory criteria. Use 1-2 capsules daily and take care of your cognition with these high quality nutrients. Nerves are part of the peripheral nervous system and consists of bundled nerve fibres. They are in fact the organ system that play a coordinating role in controlling muscles and the processing of sensory stimuli. Nerve tablets can be made with a branded or patented ingredient and include all relevant micronutrients that contribute to the maintenance of healthy functioning of the nervous system and support the transfer of impulses between (nerve) cells. The formula has approximately 150 mg available for adding any ingredient(s) of choice, in order to make the product optimal effective, customize it to market trends or comply with regulatory criteria. Use 2 tablets daily and take care of your nerves with these high quality nutrients. Emotional wellness is important for everybody and is felt best when our body is in a well-balanced state. This means that all our biochemical processes including hormones and neurotransmitters are in a healthy balance. Mental capsules can be made with a branded or patented ingredient and include all relevant micronutrients that contribute to the maintenance of a good mental balance, a positive state of mind and support during stress situations. The formula has approximately 750 mg available for adding any ingredient(s) of choice, in order to make the product optimal effective, customize it to market trends or comply with regulatory criteria. Use 1-2 capsules daily and take care of your mental balance with these high quality nutrients. Eyes are essential to observe, often three-dimensional and in colour. They make sure that people can orient, focus and see. Eye capsules can be made with a branded or patented ingredient and include all relevant micronutrients that contribute to maintaining a healthy vision and support normal fluid balance of the eye. The formula has approximately 450 mg available for adding any ingredient(s) of choice, in order to make the product optimal effective, customize it to market trends or comply with regulatory criteria. Use 1-2 capsules daily and take care of your eyes with these high quality nutrients. The hair that grows on the head of people is generally seen as healthy and attractive. They also protects the scalp from cold and other external influences. Hair capsules can be made with a branded or patented ingredient and include all relevant micronutrients that contribute to maintaining healthy hair and support normal hair pigmentation. The formula has approximately 1100 mg available for adding any ingredient(s) of choice, in order to make the product optimal effective, customize it to market trends or comply with regulatory criteria. Use 1-2 capsules daily and take care of your hair with these high quality nutrients. Skin is the outer covering of the human body and has many important functions including protecting against external influences and helping to regulate body temperature. Skin capsules can be made with branded or patented ingredient and include all relevant micronutrients that contribute to the maintenance of healthy skin and support as an antioxidant. The formula has approximately 900 mg available for adding any ingredient(s) of choice, in order to make the product optimal effective, customize it to market trends or comply with regulatory criteria. 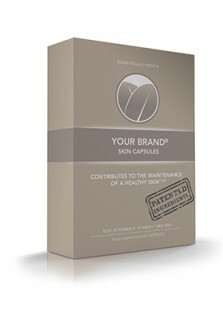 Use 1-2 capsules daily and take care of your skin with these high quality nutrients. Nails are the hard protection that every person has. They are designed to protect nerve endings in the tips of the fingers and toes. Nail capsules can be made with a branded or patented ingredient and include all relevant micronutrients that contribute to maintaining healthy nails, support cell renewal and support the production of cells and tissues. The formula has approximately 950 mg available for adding any ingredient(s) of choice, in order to make the product optimal effective, customize it to market trends or comply with regulatory criteria. 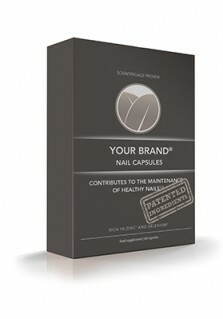 Use 1-2 capsules daily and take care of your nails with these high quality nutrients. Teeth are very important in cutting and grinding of food. In addition, teeth may also play an important role in relation to speech and appearance. Teeth tablets can be made with a branded or patented ingredient and include all relevant micronutrients that contribute to the maintenance of healthy teeth and support the condition of gum tissue. The formula has approximately 300 mg available for adding any ingredient(s) of choice, in order to make the product optimal effective, customize it to market trends or comply with regulatory criteria. Use 2 tablets and take care of your teeth with these high quality nutrients. Fertility is the ability of an organism to reproduce itself. Within this context, man’s fertility also depends partly on the quality of his sperm. Male fertility capsules can be made with a branded or patented ingredient and include all relevant micronutrients that contribute to the maintenance of healthy male fertility, normal synthesis of steroids, regulation of hormonal activity and supports normal testosterone levels in the blood. The formula has approximately 1150 mg available for adding any ingredient(s) of choice, in order to make the product optimal effective, customize it to market trends or comply with regulatory criteria. Use 1-2 capsules and take care of your (male) fertility with these high quality nutrients. Healthy nutrition is important during pregnancy, but does not deliver all essential nutrients. A healthy pregnancy diet will promote your baby’s growth and development. Pregnancy capsules can be made with a branded or patented ingredient and include all relevant micronutrients that contribute to maternal tissue growthduring pregnancy, normal formation of red blood cells and hemoglobinand support the normal growth of children. The formula has approximately 600 mg available for adding any ingredient(s) of choice, in order to make the product optimal effective, customize it to market trends or comply with regulatory criteria. Use 1-2 capsules daily and support your pregnancy with these high quality nutrients. A cell is the smallest living component of our body and the base of the human organism in which all life renewal processes occur. Cell renewal capsules can be made with a branded or patented ingredient and include all relevant micronutrients that contribute to the process of cell renewal and support normal DNA synthesis. The formula has approximately 580 mg available for adding any ingredient(s) of choice, in order to make the product optimal effective, customize it to market trends or comply with regulatory criteria. Use 1-2 capsules daily and take care of your cells with these high quality nutrients. A cell is the smallest viable component of our body and is the base of the human organism in which all life processes occur. Cell protection capsules can be made with a branded or patented ingredient and include all relevant micronutrients that contribute to cell protection and support the functioning of cell membranes. The formula has approximately 480 mg available for adding any ingredient(s) of choice, in order to make the product optimal effective, customize it to market trends or comply with regulatory criteria. Use 1-2 capsules daily and take care of your cells with these high quality nutrients.